It was another full day. I began at the interfaith tent, which hosted a panel discussion on “Native traditional spiritualities in conversation with Christianity” and ended the day at “Writing Truth, Imagining Reconciliation” featuring a strong line-up of writers, including Basil Johnston, Beatrice Mosionier (In Search of April Raintree), and Giller Prize winner Joseph Boyden, speaking or reading from their work. But the heart of the event is the sharing/healing circle, so once again I sat witness as best I could, first in the tent where there was a men’s circle, and then in the tent where there was a women’s. 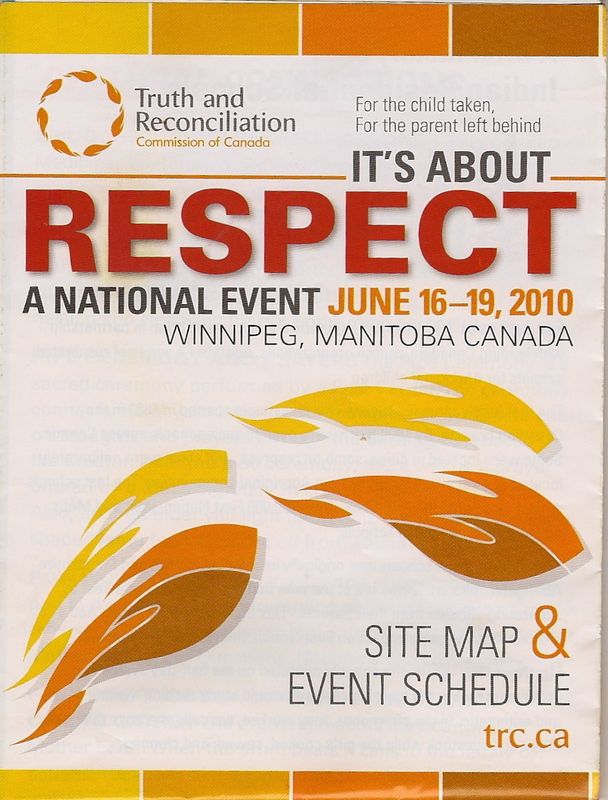 What I was witnessing, I realized, was not only the impact of Indian residential schools, via the sharing of survivors, but a constant ministry of community support. A painted stone (painted by children) waiting on the chair of each person in the sharing circle itself, to hold while speaking. Traditional spiritual supports like opening prayers, “blessed” water to drink for participants, the smudge, eagle feathers. And more contemporary supports, like kleenex and the blue-vested “counsellor” people constantly in attendance. (Tear-soaked tissues are not garbaged but gathered to be offered on the sacred fire later in the day.) When the telling gets especially difficult, a family member (though everyone is addressed as “relatives” in the circles) might be standing behind the speaker, hand on their shoulder. His voice wavered on the edge of breaking for many sentences at this climax of his story, but he got through them, and while he was doing so there was an even older man bending in front of him, continuously stroking his hand. And when Patrick finished, his son was there too, embracing him. I’m sitting at the edge of the “gallery” in the tent where the men’s sharing circle is underway, listening, and then there’s this slender middle-aged aboriginal woman dropping into the empty seat beside me, and although we’re complete strangers she sets to nattering in my ear as if we’re long-time friends. “Where are the Mennonites?” she begins without introduction. “The other churches are here, not the Mennonites.” I don’t know what she means. Not in attendance at this venue, not in the official interfaith tent, not in the settlement of the churches? So I have to tell her I’m Mennonite (obviously it isn’t obvious! ), and she’s taken aback, but only for a moment it seems, before she’s at my ear again. “There was abuse there too.” And in these ongoing intermittent bursts of words while I’m trying to listen to something else, until she spots someone outside the tent and leaves as abruptly as she came, she’s at me, naming the school, naming people, saying other things I don’t quite catch. I don’t know what to make of her. Is she someone who accosts one stranger after the other with her information, like Samuel Coleridge’s ancient mariner? Or is this gnat-like exchange divine, in origin and purpose? I’ve been thinking that perhaps it was meant to remind me that the participation of non-aboriginals like me isn’t about coming in just to observe or offer a kind of self-contained or dispassionate “listening.” The thing is, I’d already had an uncomfortable reminder of my own need earlier that morning as I felt judgment replacing compassion within me for one of the speakers at the interfaith tent, someone who went on and on and on, angry, it seemed to me, and in a certain preaching style I have my own issues with because of my past, and I could hardly hear what he was saying because of it, or keep in mind those 17 foster homes he said he’d lived in as a kid. So here was the gnat in my ear. Where are the Mennonites? Oh, you’re one? Well, you too, you know. Right. Me too. In this messy, needy human stew. This entry was posted in Current events, Mennonite, Personal and tagged Basil Johnston, Beatrice Mosionier, Indian residential schools, Joseph Boyden, Mennonites, Truth and Reconciliation Commission by doradueck. Bookmark the permalink. Oh Dora. Good for you. Thank you for being there. We are all implicated in this mess we call life, aren’t we? I too, find it hard to ‘hear’ when the voices are strident and preachy…gets my back up immediately, and like you, it’s all about my own stuff. But then, it’s like you said, we have to somehow get past ourselves and get beneath it to really hear and let go of our need to judge. Thank you for this.